Gibson has announced a new and very limited edition run: the 50th Anniversary 1968 Les Paul Goldtop. Technically, the guitar is a reissue of essentially one of Gibsons first reissues - wrap your head around that! In 1968, Gibson decided to bring back two models that were discontinued a decade earlier, the Les Paul Custom and the Les Paul Goldtop, due to increasing demand from guitarists of the late '60s hunting down older '50s models for their quality and tone. 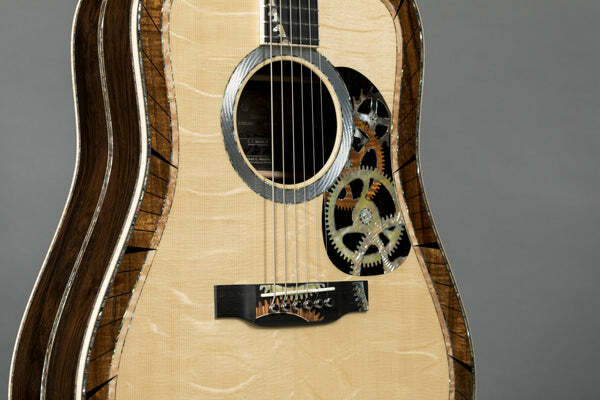 The Martin D-200 Deluxe was first introduced in 2017, as a special collectors piece honoring Martin's 184th anniversary and 2 millionth serial number. Built with care and in extremely limited numbers, #16 has just been finished! Fender has just announced limited edition runs of a pair of their most popular amps - a '65 Princeton Reverb with a 12" Jensen C12Q speaker, and a '68 Custom Deluxe Reverb with a lightweight pine cabinet and a Celestion Neo Creamback speaker. Summer NAMM 2018: New Martin Limited Edition Guitar Models + A Ukulele! Summer NAMM is right around the corner and our friends at Martin Guitars are geared up and ready to launch a new set of unique and limited edition acoustic guitars, as well as a ukulele. Among these are the OM Arts & Crafts, D-28 Bigsby, Jimmy Buffet Custom, D-16EPD Poker Dogs, and a Konter Ukulele replica. New from the Gibson Custom Shop is this pair of limited run 50th Anniversary 1968 Les Paul reissues, including a stunning Heavy Aged Goldtop Les Paul and a "Black Beauty" Les Paul Custom.